Unlike the Ramones, the Undertones weren't content to stay teenagers forever and that, ironically, was probably their undoing. The growing maturity in evidence on each successive LP—both in terms of song-writing and production—met with greater and greater resistance from the fans who had first championed their arrival. As horns and strings began to augment guitars and drums, (teenage) kicks kept getting harder to find and in 1983 the band broke up. I stuck with the band all the way and appreciated what they were trying to achieve throughout all their various phases. But I must confess, for a true shot of adolescent adrenaline, nothing beats the two minute pop attacks you'll find on the first, self-titled album. 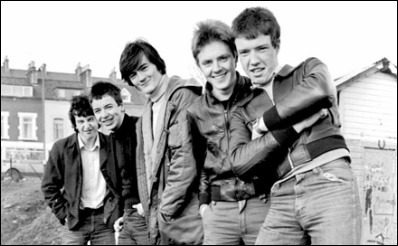 Today's Happy Medium Song of the Day is “Teenage Kicks” by The Undertones.